A very common way for people to search is by typing the general service or product they’re after into the Google search box, followed by their city or town. Example: “sports physiotherapists Coffs Harbour” or “Italian restaurants in Sydney”. What can you do if you are a local business with a website? Make sure that those common search terms for your kinds of products or services plus your location or service area (these important terms are referred to as the SEO keywords you target) appear on your website. That way Google can make that match and your website will be served up in the search results. That’s why it is very important to use the various keywords that people may use to look for your services liberally throughout the text on your website and in your page titles and headings, among many other things. If your business is local, make sure you also include your full address and telephone number on your website, particularly on the homepage and contact page, but preferably even on every page. Bottom line: Optimise your website for search engines and you’ll rank well in the free search results and won’t have to spend money on Google Adwords. What if you have a business but DON’T have a website? Don’t worry. Although you’ll always perform better online if you do have your own website, there are still many things you can do to appear in the search results in the categories your business is active in. There are dozens of websites where you can list your business for free, often with a description of your products and services, location, contact details and a link to your website if you have one. Even if you don’t offer online transactions, many people do their research online and select a business before picking up the phone or visiting the outlet. So your business needs to be in those listings. Where to list your business? If you only have time to list your business on 1 website, make it Google My Business (this includes a listing on Google Maps and was previously known as the Google Local Business Center). Sign up for a free account and you can add a description, contact details, opening hours and even images and video. Very importantly, in Google My Business, you can select up to 5 categories you wish to appear under, and place your business on the map. So now, when people search for your type of business in Google (the search engine that accounts for over 90% of all online searches in Australia), your company will be included in the search results and your location will even be shown on a map. But wait, there’s more. 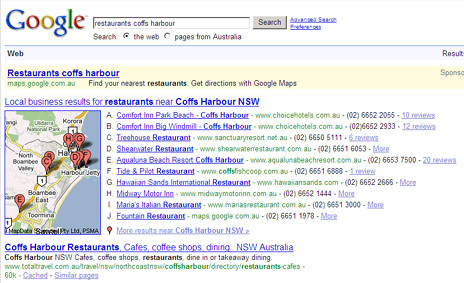 Once your business appears in Google Places/Maps, people can also leave reviews. Ask your loyal customers to spend a few minutes online to leave a good review, and not only does your business show up, but it will appear higher in the list, and potential customers will get a good impression of your business too. Other local online directories where you can submit your business details for FREE – whether you have a website or not – and that may show up (and sometimes even rank well) in search engine results pages, include: AussieWeb, GoGuide, HotFrog, StartLocal and TrueLocal. These are some of the major ones for the Australian market. Other countries will have other popular local, regional or national directories. Yelp is big in North America, for example. Also look out for major local and regional directories. And if you do have your own website, make sure to add a link to it. Be aware that after adding your free listing, you may get a call from a sales rep who will try to sell you a premium, advanced listing. Just be firm and resist if you’re not interested. Your free listing has no strings attached. So take advantage of the free listing opportunities available on the Internet and you’ll see that more people will find you, even if they had no idea you existed. And if you have a website, make sure it is optimised for search engines so it will show up in relevant search results. If you need help optimising your website, you can contact me, Micky Stuivenberg, a certified Search Engine Optimiser and Website Copywriter, for advice and rewriting of your content and page titles or making any other changes needed to rank higher for your targeted SEO keywords.